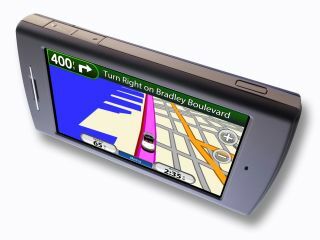 Garmin has announced that it’s launching a slick new device that’s both a GPS navigation gadget and a mobile phone. Called the ‘nuvifone’, it’s an all-in-one toushcreen handheld designed for those people who want to own a GPS and a mobile, without having to carry two separate devices. "The nuvifone is an all-in-one device offering unmatched integration of utility and function in a single mobile device," said Cliff Pemble, Garmin's president and COO. "This is the breakthrough product that cell phone and GPS users around the world have been longing for - a single device that does it all." The Garmin nuvifone combines a wide range of advanced features that Garmin says are all ‘easy to use’. The touchscreen device is certainly the first of its kind to integrate premium 3.5G mobile phone capability with an internet browser, data connectivity, personal messaging, and personal navigation functions all in one gadget. The nuvifone is Garmin's first device to include Google local search capability, which harnesses the vast points-of-interest information available from the world wide web. Nuvifone users can search for locations like "coffee shops" and Google will sort the results based on your current location and relevance. It’s a fully-functional GPS device then, so what about the phone features? Well, the nuvifone also appears to be a fairly comprehensive 21st century mobile. It’s got a built-in camera, and whenever you take a picture it will automatically be tagged with the exact latitude and longitude reference of where the image was taken. Other multimedia functions of the nuvifone include a built-in video camera, MP3 and MPEG4/AAC playback. Garmin says the nuvifone will be released in the second half of 2008, although it was not forthcoming with an exact date, or a retail price for the UK.